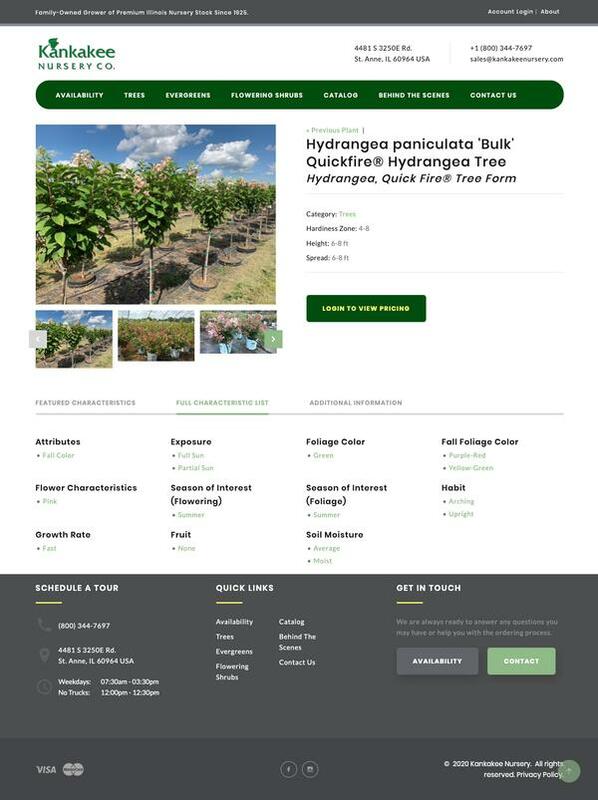 From wholesale growers specializing in young plants to those specializing in large nursery stock with multiple growing locations, we have creative, practical website and marketing solutions for all types of wholesale growers. We custom design each website to match our clients needs. Our customers, even the 'non-technical ones', can easily update their websites using our Clarity Console website content management tools. If you would like a demonstration of our technology, please contact us. We have solutions for all business sizes. For small niche growers we have templated solutions that are low cost and very quick to deploy. For medium and large groweres we have a broad range of solutions to pick from to meet your requirements. Over time, you can easily add additional functionality to continue to make it easier for your customers to do business with you. You can display inventory availability on your site. It can be as simple as attaching a file/updating it whenever you need to; or we can have the site integrate with your inventory/business system and automatically update the online availability. We can monitor quantities available to not allow sales for out of stock plants. 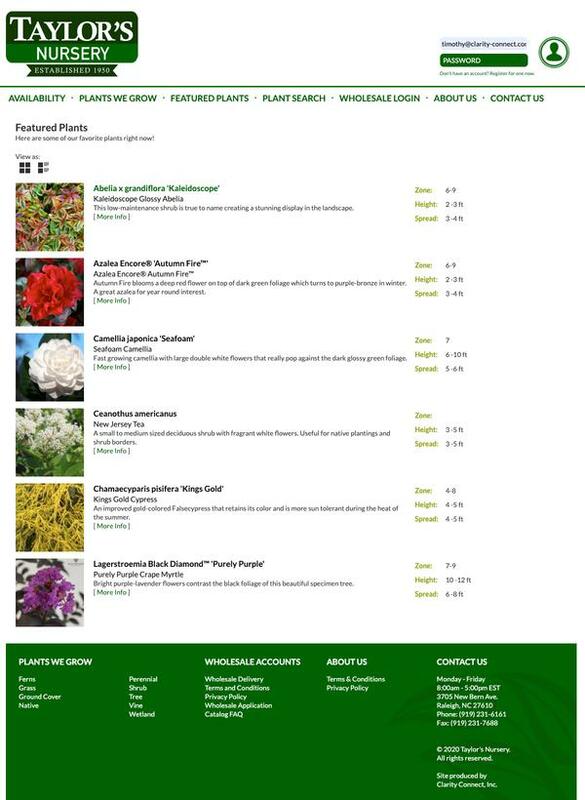 Virtually all of our wholesale growers now include online ordering. We will work with you to ensure the online ordering process and pricing works for you and your customers. Your website can require online payment or allow your customers to place their order without payment and you invoice them as per your normal processes. In fact, you can allow specific customers to purchase on terms while others would need to enter a credit card to complete their order. We will have discussions with you to find out what your business objectives are for you new website. We will then schedule a webinar (online conference call to share screen images) to demonstrate various solutions to meet your goals. We incorporate your comments, feedback and budget to prepare a detailed site map (see example at bottom of page) as well as a fixed priced proposal. The site map details the proposed functionality - including Clarity Console tools needed to meet your objectives and budget. We make modifications to the site map and proposal based on your feedback. When we have a final scope and price, we start to work on your new custom designed Home page. We believe it is important to create a design that is appropriate for your company and your customers. If you have an existing 'look and feel' for other marketing materials, we will use key graphical elements (logo, imagery, fonts, colors, etc.) from those marketing pieces to extend your brand in your new website. We will create one or two initial designs for your review. Designs are fine tuned based on your input. We will work through this design review process with you until we have a final approved design. We create a custom design for each of our customers. If you have your own in-house designer, we can work with them and provide direction for them to lead the design effort. After approval, we implement the design allowing your content to be added with your licensed Clarity Console tools. This process takes place on our development server; therefore, only those with the proper access will be able to see the site as it is being built. We train you and your staff how to use the Clarity Console tools during one or more webinars. Teaching you to add content to the site while it is in the development stage. You will also be able to modify, add and delete content using the same skill set once the site has been released to the live environment. Our customers have unlimited customer training and support. When you are satisfied with your content, we will release your new site LIVE. If you have an existing site, the same URL (website address) will display your new site once it is released. Once the site is launched, you will be able to continue to add, edit and delete content from your site with your licensed Clarity Console tools. If you would like a demonstration of our technology and a no-obligation quote, please complete a request form . We will contact you within 48 hours. You can also contact us directly.